My mom loves Italy. Anyone who knows her – or me, for that matter – knows that. She visits frequently, for several weeks at a time, taking language and cooking classes while exploring her way around the country. This spring I went to meet her toward the end of one of her visits. She’d been staying in Salerno with her friend Julie, and I met her there toward the end of her stay so we could explore the Amalfi Coast before heading out for the rest of our journey. We had one full day in the area and hopped on an early ferry to Positano. It turned out to be a day when several groups of local kids were all on “field trips” and I was left feeling really jealous that this is the type of outing these kids grow up with. The ride itself was beautiful. This trip took place early May and I’d left a rainy, chilly Maine behind so I enjoyed being on the water in the sun as we toured around. Approaching each of these towns by ferry provided the type of views you’re probably familiar with if you’ve seen pictures of the coast – colorful buildings built into the slopes of steep cliffs at the water’s edge. Stop #2 was Sorrento for lunch with a view of Mt. Vesuvius. In my mom’s travels she’s met a number of other women who also keep returning to Italy, one of which we met for lunch before we continued exploring. Each town we visited was unique and beautiful in its own way while having the feeling of familiarity that comes with tourist shops and outdoor cafes of seaside towns. 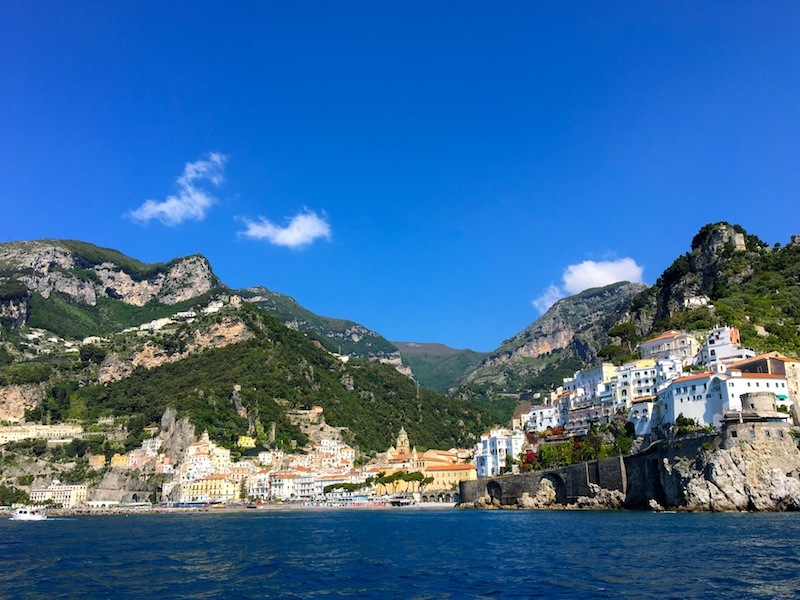 We took the bus back toward Amalfi – a trip that’s known for its views, but be sure you sit on the right side. We weren’t quick enough and while there were of course still many beautiful things to see, the bus got more and more crowded, with people blocking the aisles and views as we got closer to town. I’d stick with traveling by ferry if I ever make it back, since there’s nothing like being on the water. Back in Salerno, we enjoyed a meal at a restaurant Julie and my mom had come to love. A cute little place where we had seen the owner bringing in fresh seafood earlier that day. Local places like this and B&B Salerno Centro made me feel right at home, even on such a short visit. Your mom is a woman after my own heart! And I love that bus trip along the Amalfi Coast (despite my husband panicking the entire time :)). Enjoyed your photos and words. Tom and I were supposed to meet your Mom and Julie (my sister) in Capri on May 1st, but the weather kept them away. Such a beautiful area. I want to go back in the winter and leave the crowds behind. Caio! I heard about that trip! I guess weather was bad a lot of the time they were there, I lucked out and it was beautiful for my visit. Thanks for your kind words!